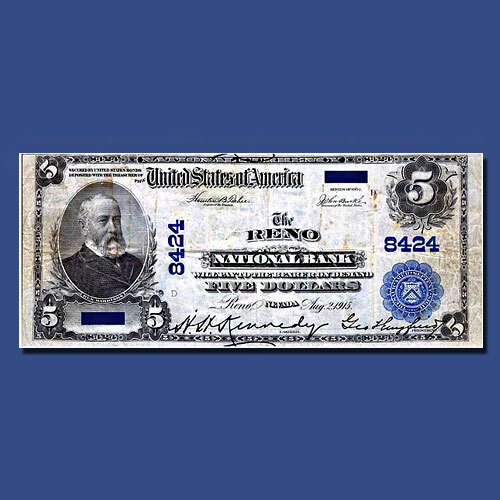 The US government started issuing banknotes for National banks after the National Banking Act was introduced in 1863. As per this system, a national bank would first deposit United States Bonds at the Treasury Department and notes were printed based on their deposit. They were issued in large as well as small formats till 1935 with other types of notes were introduced. They featured the name of the issuing bank along the city and state, province, or territory of issuance. There were 16 banks in 13 different Nevada cities. Two of the issuing charters changed their name during their issuing period, due to which Nevada bank notes with 18 different names can be found. Some banks issued large and short format paper money in varying types. Even though Reno is the only common bank in Nevada, they have a market value of $1,000. Austin, Carson City, East Ely, Elko, Ely, Eureka, Goldfield, Lovelock, McGill, Rhyolite, Tonopah, and Winnemucca are the other regions that issued notes of $5, $10, $20, $50 and $100 denominations. Rhyolite and Austin notes have not yet been discovered by collectors. Experts believe that these notes would have a market value of six figures. When the National banknote system was revoked, the notes went into receivership and were destroyed. Only a few of these Nevada Notes exist, some of which have a market value of $10,000 to $100,000 while many have a market value of $40,000 to $100,000.